Thread: How to quilt these little houses? You could sew in a door, and perhaps a window or a chimney (I don't know how big the houses are). You also could outline quilt about a half inche away from the sides and tops of the houses (I'd stop at the white line above the houses). A white on white tree in the bigger blank spots would be another idea (it could be free form because real trees are). Your pattern is really a cute set up! Love your color choices. I would start with SITD around all the houses even making an invisible house in the white squares. I would then think about adding a round hole in the center of each house to make them into birdhouses? Really cute top! I agree! 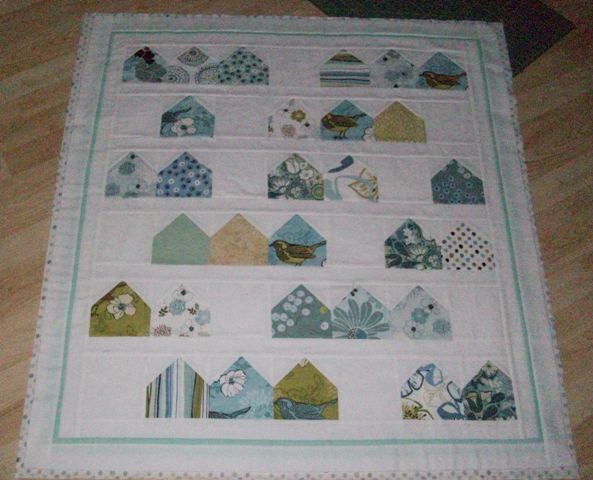 Cute quilt - can't wait to see the "after" pictures. I'm no help but wanted to tell you your quilt is very pretty! You are doing a great job on it!